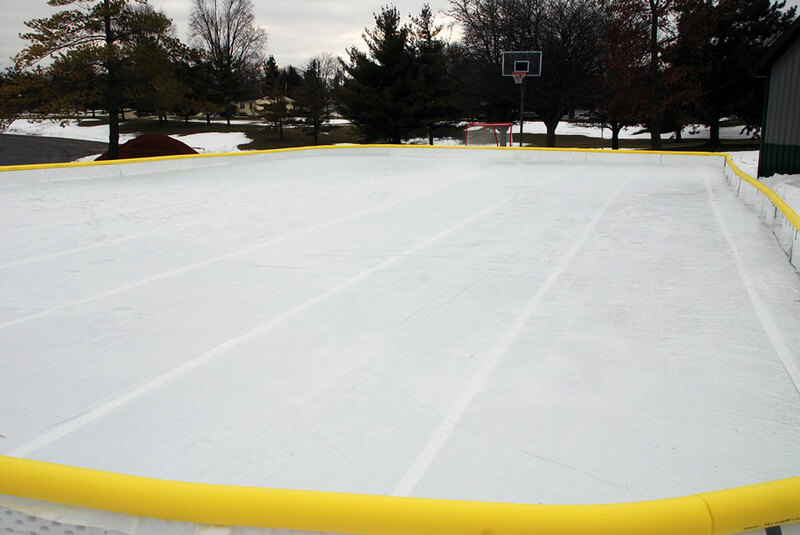 The new Huntington University ice rink. On January 26, Huntington University held a grand opening for its new ice rink. The portable rink covers the outdoor basketball court in front of the Merillat Complex Fieldhouse and will remain in place during the winter months. The Athletics Office purchased skates, along with hockey sticks and pucks, for students to use. The Fort Wayne Komets, a pro hockey team, are the lead sponsor of the facility. This was totally a student-led and student-executed project. Tyson Kalischuk (right), a junior from Calgary, Alberta, Canada, presented the idea through the student sennate’s Think Tank competition in November. His ice rink proposal was voted students’ favorite idea to improve the campus, and he was awarded $700 to help fund the project. He embarked on a fundraising campaign for the remaining resources needed to purchase and maintain the ice rink. To date, Kalischuk has raised $6,850 from student organizations and campus offices, and from outside sponsors. That $675 more than the projected amount needed to cover the costs. Global Ministries, through its partnership in with International Needs, is now working on Turkey’s border, where refugees are flooding in from Syria and Iraq. The United Nations High Commissioner for Refugees counts over 1.6 million refugees (and growing) now living in Turkey. Most are from Syria. Half of them are children. We invite you to help support these efforts. The Islamic State (ISIS) and fighting in Syria has forced tens of thousands of people from their homes. Now they are trying to survive in camps amidst snow and sub-freezing temperatures. Christians are meeting the refugees in their despair, providing hope found in Christ alone. Konutgan says many refugees were stuck in the mountains without food or water. The stories from the mountains are horrible. One woman told Konutgan that some women, not wanting to see their children suffer, threw them off the mountains to their death. Another woman told him that she gave her daughters to a Saudi man and gave him $50. He said he would take care of them until the conflict ended. She hasn’t heard from the man and believes her daughters were kidnapped. To help with refugee support, you can send contributions to Global Ministries. Contributions will then be forwarded to International Needs. At the Honduras Conference waterpark. Honduran National Conference is working hard to develop numerous sources of income for church planting, pastoral assistance, and missions. 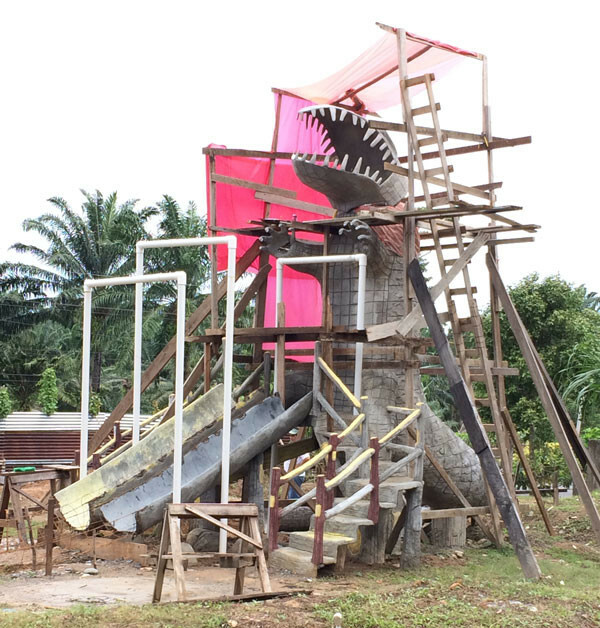 With very limited resources, they have found it necessary to be creative and ingenious. 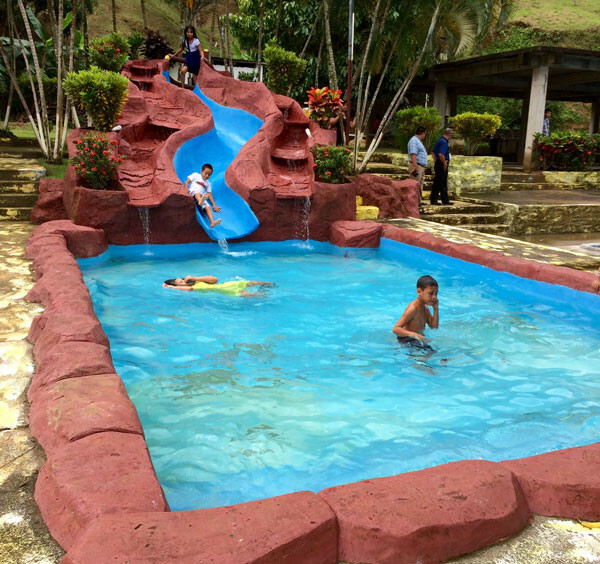 The new waterpark at the conference retreat center is just one example. The property lies on the coastal highway just outside the city of La Ceiba. It was purchased fifteen years ago. 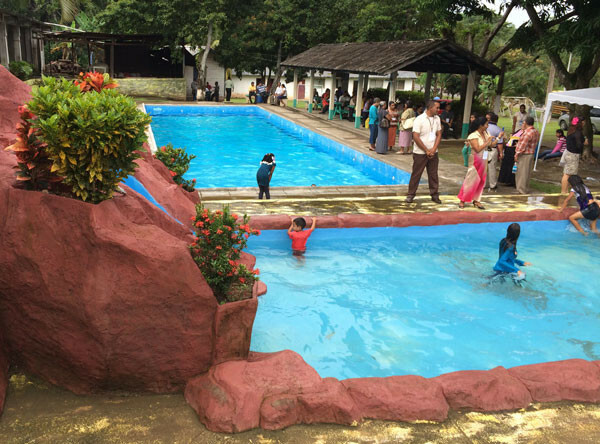 Since that time, a traditional pool and some picnic shelters were built. However, the long-range plan after completing the waterpark is to build a sports complex, a conference center for business meetings and receptions, and a small hotel and bungalows for snow birds. They are targeting local schools, municipal programs, and local businesses. But they would also market to tourists. I had the opportunity to tour the center on January 15. They’ve made a great start as the project moves one stage at a time. They don’t overlook a single opportunity to turn a profit, including the sale of fruit that grows on the property. If you’d like to know more about this project, contact us at info@ubglobal.org. Rev. Billy Simbo, former bishop of Sierra Leone Conference, lives in the United States but makes frequent trips back to his homeland. He had planned to return in September, but since British Airways canceled so many flights because of the Ebola crisis, he had to delay. But now, after an eight-month absence, he’ll be back in Sierra Leone on January 17. Todd Fetters opening up the gathering. 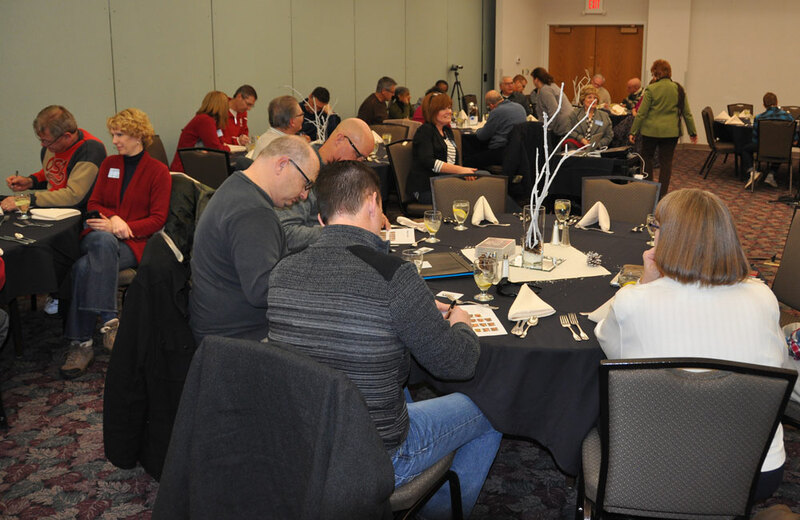 Bishop Phil Whipple and Dr. Sherilyn Emberton, president of Huntington University, spoke prior to the meal on Monday night. Attaboy sang and led in worship on Monday night. Cluster leaders fill out the Name Game. 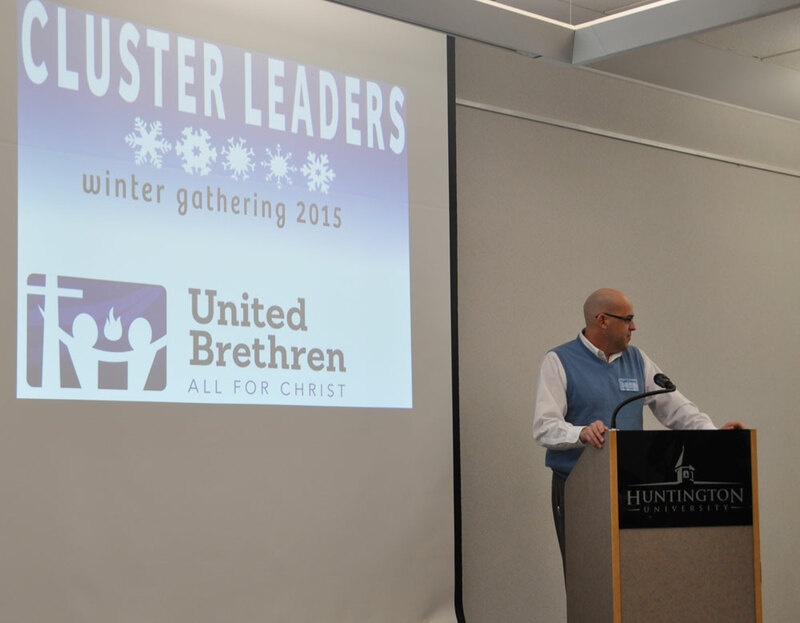 Every January, the cluster leaders come to Huntington, Ind., for some training. This year, 17 of the 27 cluster leaders attended on January 12-13. 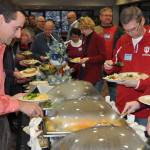 The meeting was held at the Habecker Dining Commons at Huntington University. The meeting began Monday evening. 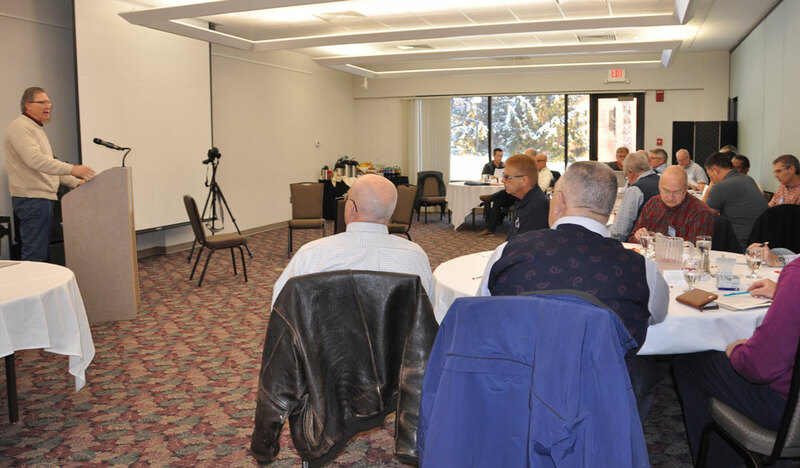 The person in charge of the meeting was Todd Fetters, director of National Ministries, whose responsibilities include overseeing the clusters. He opened the meeting. 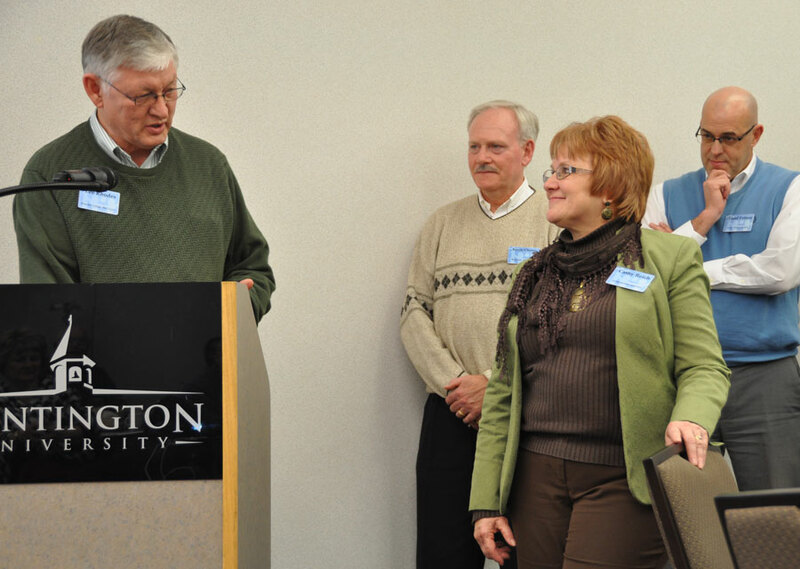 Bishop Phil Whipple gave a devotional, after which Dr. Sherilyn Emberton, president of Huntington University, spoke about the important relationship between the denomination and the college. Then it was time to eat. 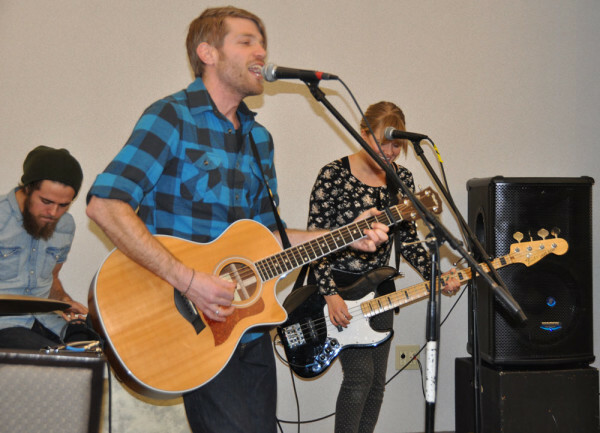 Attaboy, a musical group affiliated with Huntington University, provided a half hour of music and worship. 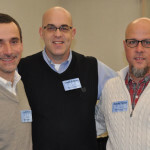 They described their new focus on ministering in public schools, and told of the success they’ve had already. They are making themselves available to churches. The evening concluded with a “Thank You” time for Cathy Reich, administrative assistant to Bishop Whipple and Todd Fetters. 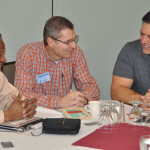 Cathy interacts constantly with cluster leaders and other pastors, making all travel arrangements for them and making other contacts on behalf of the national office. Most of the cluster leaders had written words of appreciation. These were compiled and presented to Cathy. Three of the cluster leaders were asked to read their statements at the meeting. 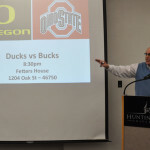 After the meeting, a number of cluster leaders went to the home of Todd and Lisa Fetters to watch the national championship football game between Ohio State and Oregon. 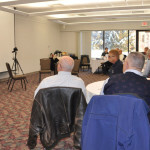 On Tuesday morning, the group gathered at 8am for the actual training. 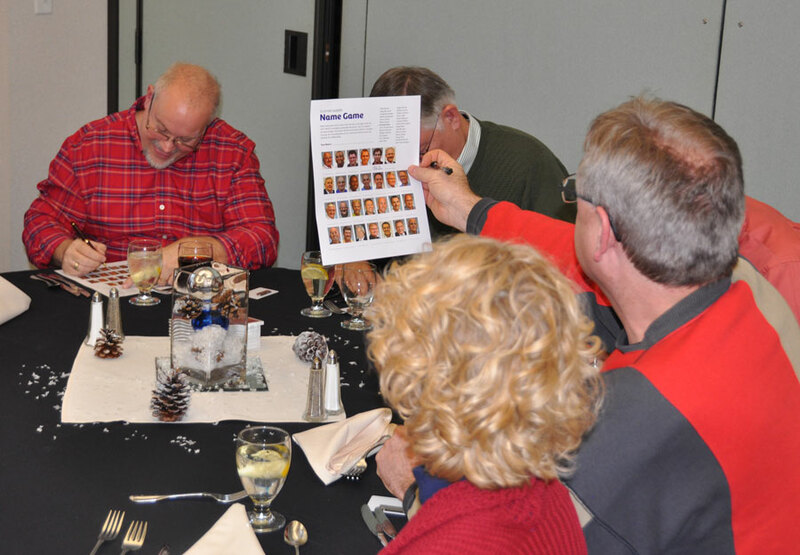 The previous night, the cluster leaders were given a page with the photo of all 27 leaders, and a separate list of the names of the cluster leaders. To see how well they knew each other, they were asked to match names and faces. Those papers were turned in Monday night, and Cathy Reich “graded” them. Two persons got all of them correct: Rocky Spear, pastor of Mongul UB church (Shippensburg, Pa.), and Craig Burkholder, pastor of Hudson UB (Hudson, Ind.). 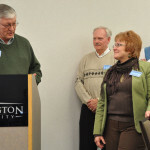 They were both recognized first thing Tuesday morning and given a prize. Mike Dittman, who heads a ministry called Haven of the Heart, was again (as in 2014) the main speaker. 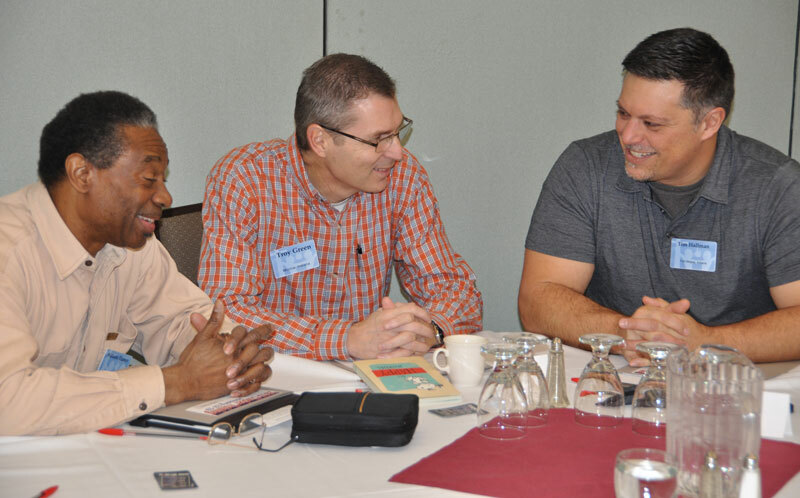 He addressed matters related to the pastor’s heart, and demonstrated how to lead a cluster group discussion. After a buffet lunch at the university, the meeting concluded. 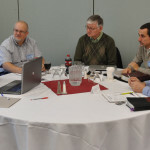 Below are a few photos from the Cluster Leader Training. 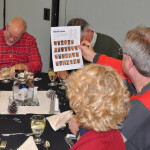 Over 50 photos are included in an album on the United Brethren Facebook page. 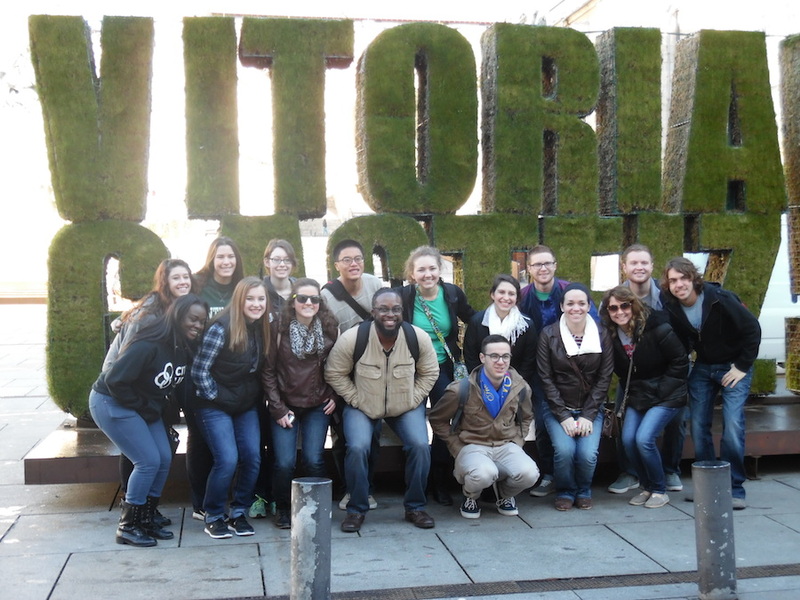 Huntington University students in Vitoria, in the Basque region of Spain. A group of Huntington University students is spending January Term in the Basque region of Spain. Donna Hollopeter, associate director of Global Ministries, is leading the trip. 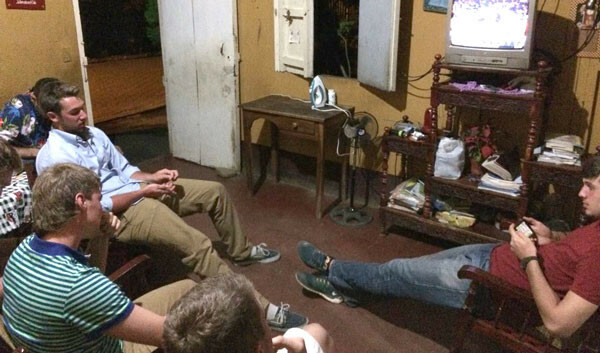 The baseball team in Nicaragua. 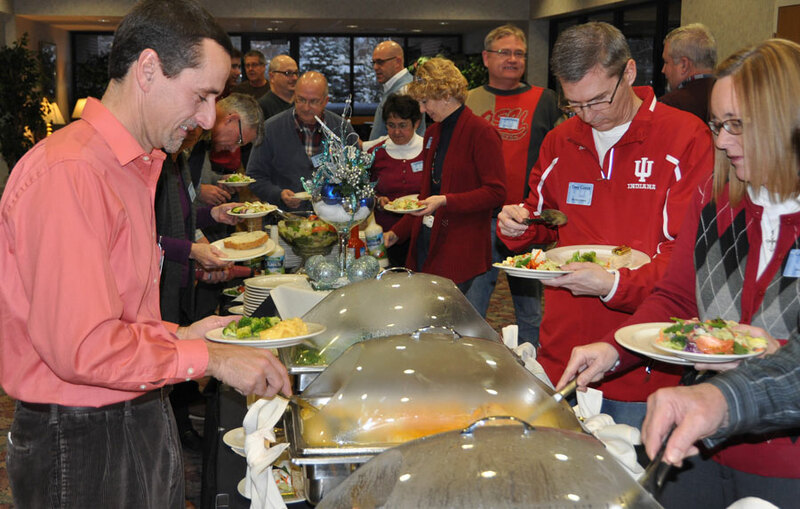 The team was able to watch the Colts-Broncos playoff game on Sunday. 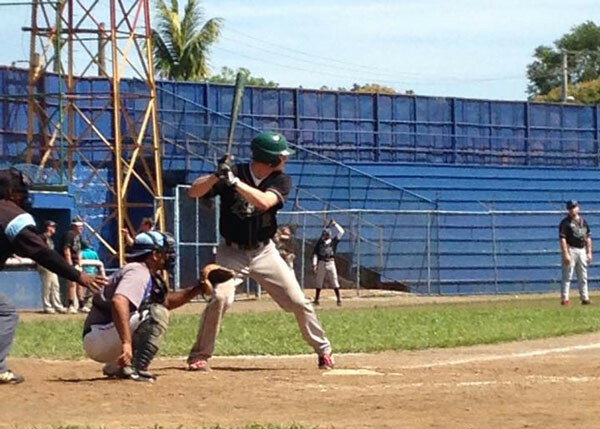 A baseball team, most from Huntington University, is in Masaya, Nicaragua. They are conducting baseball clinics for kids during the day, and (often) competing against Nicaraguan baseball teams at night. The HU students in Paris. HU students with the Eiffel Tower in the background. 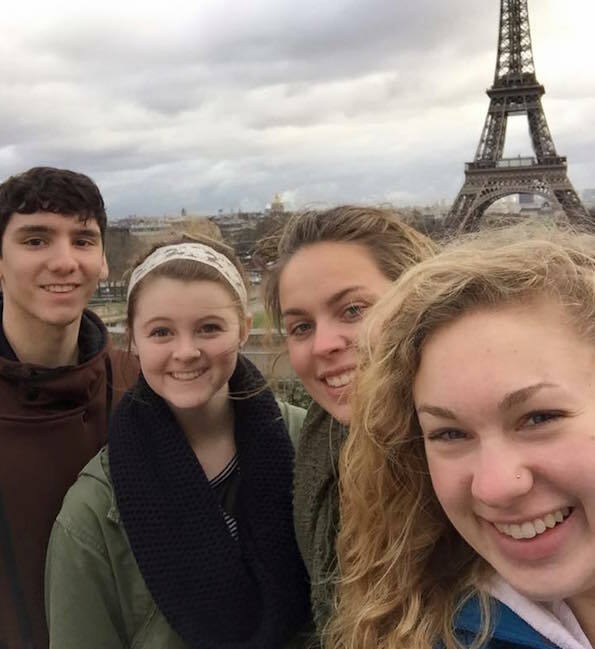 A group of 12 Huntington University students are spending January Term in Paris, France. They are staying about a mile from the Charlie Hedbo office, where 12 people were killed on Wednesday, January 7. However, because of a flight delay, they hadn’t yet arrived. They were supposed to land several hours before the Charlie Hedbo attack, but were delayed 24 hours in Indianapolis because of ice; that’s where they learned about the attacks. Caitlin Trainer, a senior who is on her fourth trip to Paris, is leading the trip. “I for sure went through a period of second guessing our trip once I found out about the shooting, but upon affirmation from our Paris site coordinators that it’s completely safe to travel, I made the decision to stick with the plan,” she said. Their first full day in Paris came on Friday, the day French police killed three gunmen and freed hostages. That day, they did a prayer walk around Paris, but stayed away from the Kosher store where a hostage situation was in progress. They report that they have never felt unsafe. They’ve been able to go shopping and sightseeing. For the trip, the students teamed up with an organization called Envision Paris. They are feeding the homeless, doing young adult discipleship, hosting an art exposition, and teaching English. They will return to the US on January 20. Belize. Thirteen students from Huntington University are spending January Term in Belize, working with the orphanage operated by Here’s Hope Ministries. 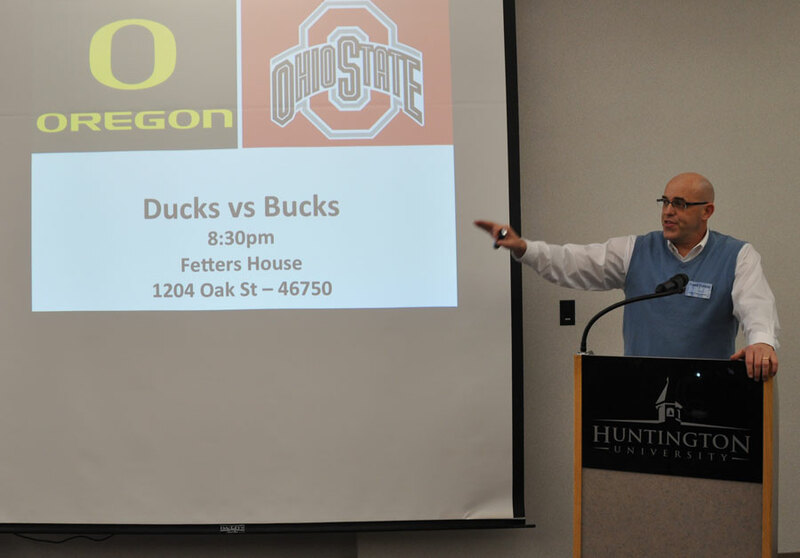 Bob Eberly, a UB member from the Otterbein UB church (Greencastle, Pa.), is the founder and head of Here’s Hope. Bob’s son-in-law, Chris Moore, a UB endorsed missionary, is in Belize with the team from HU. Nicaragua. 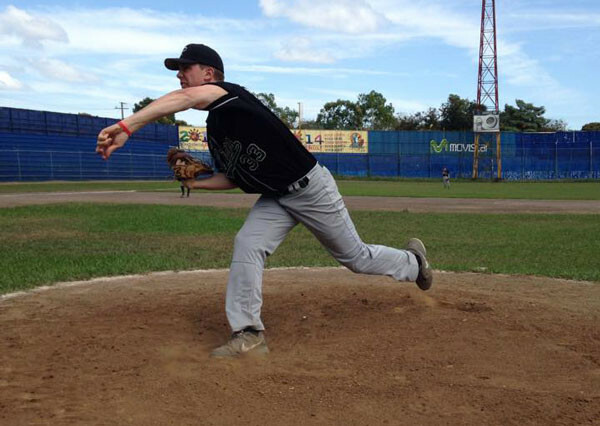 On January 7, thirteen students from Huntington University, mostly members of the baseball team, left for Nicaragua. They will spend about ten days competing against Nicaraguan baseball teams and conducting clinics for Nicaraguan young people. This is the third such trip. Josh Kesler, senior pastor of The Well (Huntington, Ind. ), and Jeff Dice, associate pastor of Brown Corners UB church (Clare, Mich.), are participating on the trip, as they did in 2012 and 2014. Spain. A team of 17 students from Huntington University is headed to Spain to spend a couple weeks working with missionaries Ron and Brenda Anderson as part of their January Term. Donna Hollopeter, associate director of Global Ministries, is leading the trip. David Kline, associate director of Global Ministries, and Norris Friesen from HU drove them in two vans to O’Hare Airport in Chicago. They were supposed to leave on Wednesday, January 7, from Chicago. However, there have been two problems. First, two of the students are Jamaicans, and visa problems are preventing them from making the trip. After reaching the airport, they were unable to board. David Kline, who was part-way back to Huntington, returned to O’Hare and took them back to Huntington. Then the rest of the group sat on the plane for a couple hours before the flight was cancelled because of mechanical problems. It’s looking like they won’t be able to depart until Friday, Jan. 9. Central America. 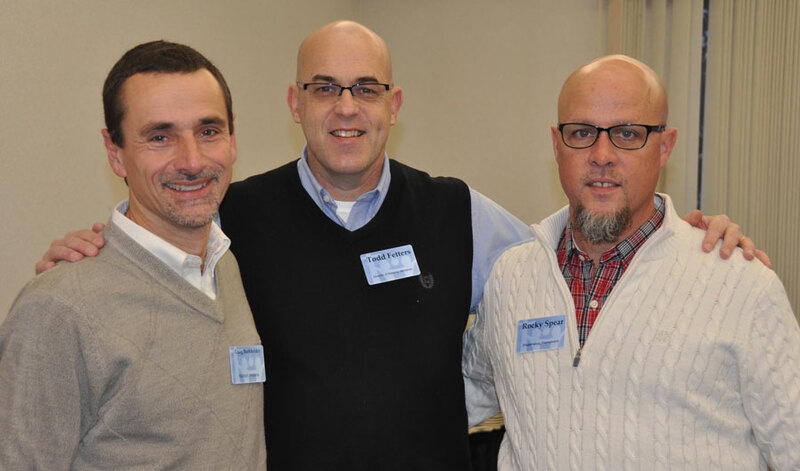 Jeff Bleijerveld, director of Global Ministries, left January 7 to spend two weeks in Central America. 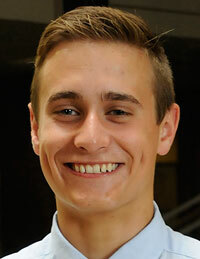 He’s starting out in Nicaragua, attending the annual meeting of Nicaragua national conference Jan. 7-12. Next, he’ll travel north to attend the annual meeting of Honduras National Conference Jan. 12-19. He’ll conclude Jan. 19-22 with a visit to Belize, where he’ll meet up with the team from Huntington University. France. Another team from Huntington University is spending January Term in Paris, France. This is not a Global Ministries-related trip, but is worth noting, particularly in light of Tuesday’s terrorist attack in Paris. Bishop John Pessima (right) and conference administrator Justin Marva sort through supplies for quarantined families. A Muslim mother and children receive relief supplies while under quarantine in the nearby village of Luawa Jong. 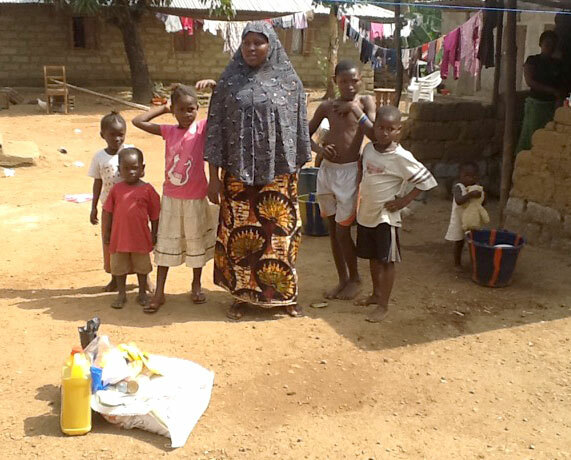 Last month we reported that a woman had died of Ebola at the Mattru Hospital in Sierra Leone. As a result, the hospital and most of its staff came under a 21-day quarantine, along with the residents of the woman’s nearby village, Luawa Jong. Bishop John Pessima provided this update along with words of appreciation for the funds Global Ministries provided for those under quarantine, and for our nine United Brethren churches in neighboring Liberia. I thank you so much for your assistance and support for the Sierra Leone Conference during this crisis. We appreciate the funds that were sent for the quarantine homes and Liberia. We sent some funds to the Church in Monrovia for relief. We went to Mattru with relief for quarantined homes. A distribution team was organized, including hospital staff and community members. A total of 15 homes were supplied. Each of these homes have family members ranging from 5 to 10 in number. We thank God because this relief was timely, and it was appreciated by both the quarantined hospital workers and community. The media was invited to take part, so it was announced over the Mattru community radio broadcasts. 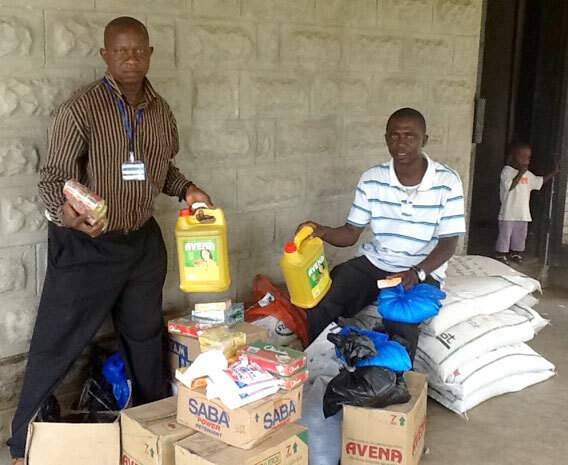 On a phone-in program over the radio that same night, people expressed their appreciation to the donors–Global Ministries and the Sierra Leone Conference–for their timely relief. The day after the distribution, a lady died in one of the quarantined homes in Luawa Jong. This home has been re-quarantined for another 21 days. In addition, we received word that the 20-foot container of medical and relief supplies gathered by United Brethren and partner churches in the Mid-Atlantic arrived and has been cleared by customs. The items will be distributed by the Christian Health Association of Sierra Leone, of which we are members. The pallet of food supplies we sent should be arriving soon, along with the 40-foot container carrying $380,000 worth of Ebola medical supplies. The supplies were obtained by Brother’s Brother of Pittsburgh, Pa. 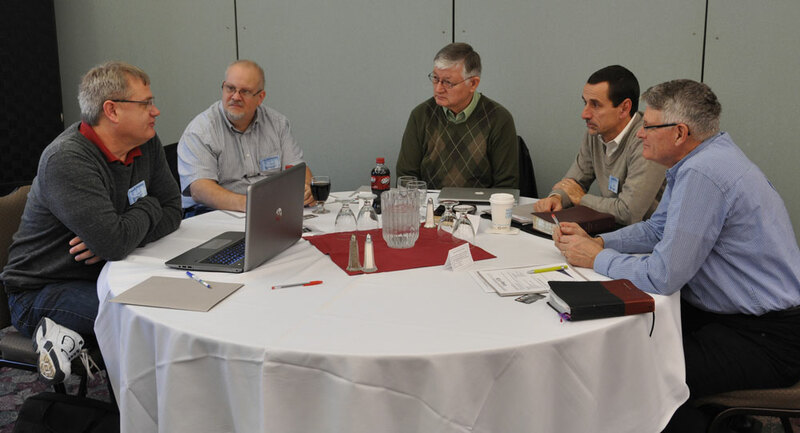 Global Ministries paid for $14,000 in shipping fees, with funds provided by generous United Brethren contributors.